Something I regret about my trip to Scotland a few years ago is that I didn’t eat fish and chips while I was there. I don’t remember many of the meals that I ate there. What really sticks out is the desserts, in particular chocolate lumpy bumpy, a combination of mousse, cake, and cheesecake. Oh, and whipped cream. Every time I ordered dessert in Scotland, I was asked if I wanted cream on it. Heck yeah I do! It’s hard for me to stay focused on dinner when I start thinking about chocolate lumpy bumpy. But missing out on awesome Scottish fish and chips is nothing to scoff at. I needed to make up for it by learning to make my own. Which isn’t as easy as it might sound. The tricky part seems to be getting the coating to stick to the fish – the first few recipes I tried, one of which was by the usually very dependable Cooks Illustrated, didn’t seem to work. When Cooks Illustrated fails me for classic recipes, I usually go to Alton Brown. 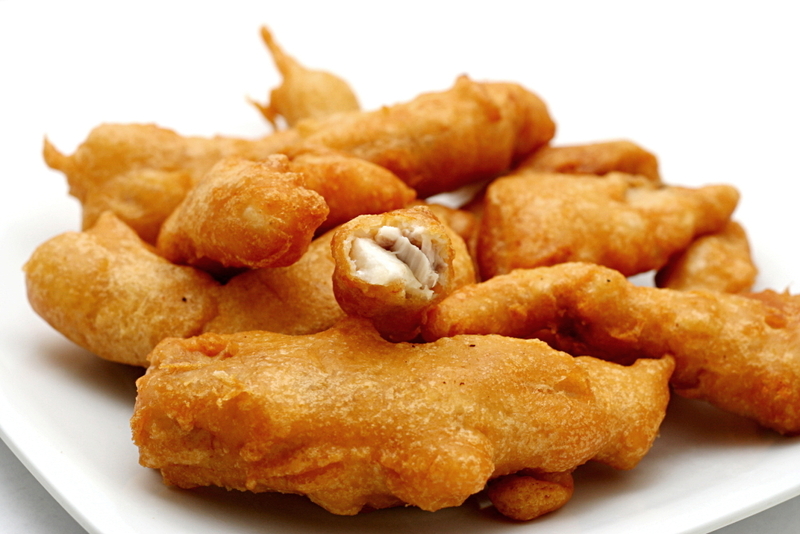 Like most beer-battered fish recipes, Alton’s batter is made with flour, baking powder, seasoning, and beer. The batter is allowed to rest before being used, which isn’t standard in beer-battered fish recipes, but also isn’t unheard of. 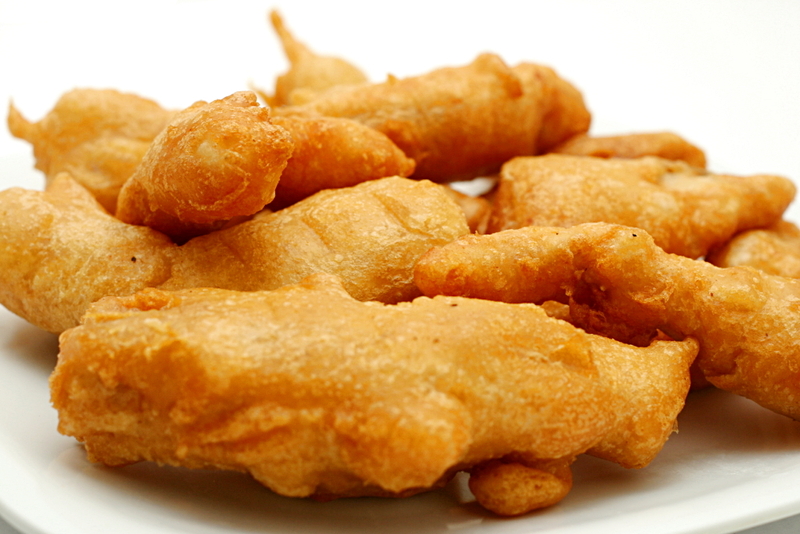 The fish are dredged in cornstarch before being coated in batter and fried. The result was great fried fish! The coating not only clung to the fish like it’s supposed to, it was crispy and flavorful. 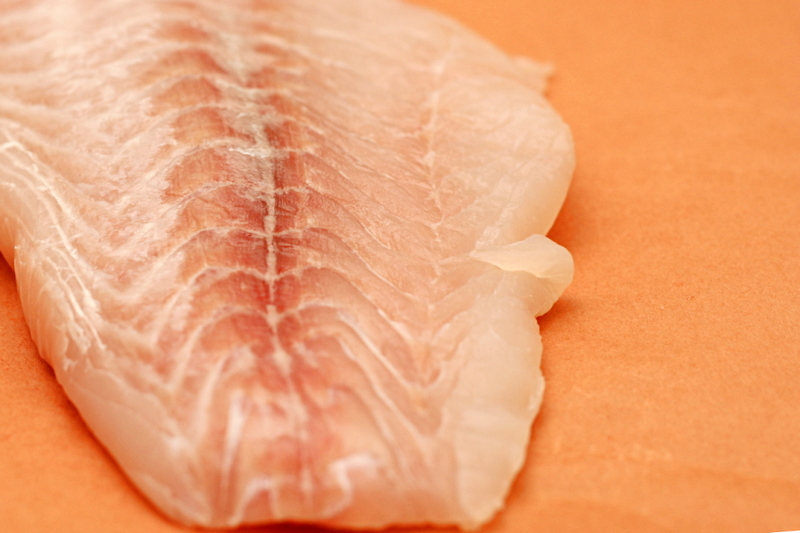 The fish was cooked through while being tender and flaky. The only problem with this meal was that it wasn’t followed by chocolate lumpy bumpy, but I could say that for most meals. I did not make and have not tried Alton’s chips recipe, so I’m not including it here. You can find it on the same webpage as his fish recipe. I think I used red snapper, but I actually made this quite a while ago and can’t remember. Does the picture look like red snapper? Heat the oil in a 5-quart Dutch oven over high heat until it reaches 350 degrees. 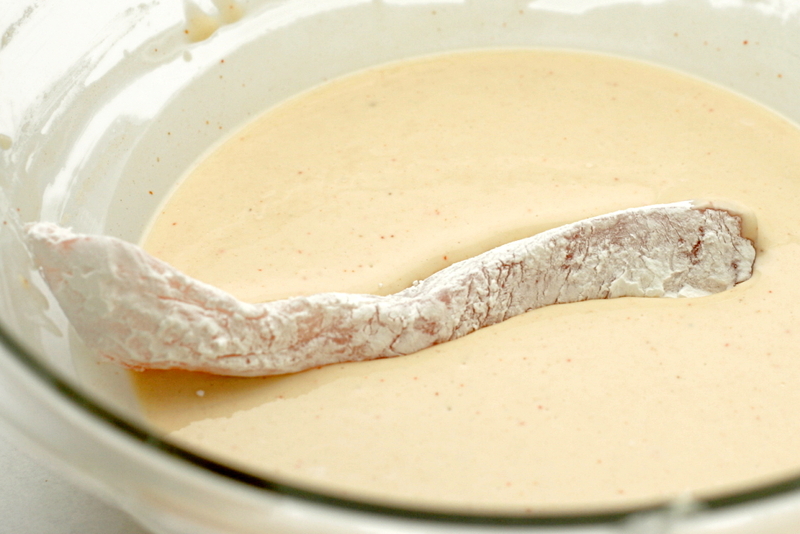 Lightly dredge fish strips in cornstarch. Working in small batches, dip the fish into the batter and immerse in the hot oil. When the batter is set, turn the pieces of fish over and cook until golden brown, about 2 minutes. Drain the fish on a wire rack set over a baking sheet. Keep the fried fish in the warmed oven while you cook the remaining batches. Serve with malt vinegar. Wow! That look like a restaurant’s fish! Good job! These look amazing! I love fish, and these look perfect! I know this question may be stupid considering the name of this famous dish, but is there a substitute for the beer? I don’t allow alcohol in my home. If not, I can just enjoy staring at your pictures and imagine how yummy they are! Wow! Yum, this looks great! My husband has been requesting fish and chips for a while so I’ll definitely have to give this recipe a shot! Wow, Bridget! This looks so fantastic. One of my cooking resolutions this year is to work on my frying (how can a girl from Oklahoma be so bad at frying?) and making this fish will help me with that. Thanks for the great post! Memoria – I’ve found that soda water or something else sparkling is a good substitute for beer if you don’t want to use it. Memoria – I’ve been meaning to look around for other fried fish recipes before answering your question, but I haven’t gotten around to it. I’m thinking along the same lines as Ali, but I was thinking that adding in some honey along with the soda water would add the same sweetness that beer does, or maybe molasses, which would provide both sweetness and bitterness, like beer. That looks perfect– forget Scotland (kidding). Definitely one of my favorite things to eat– but I won’t share with you what I dip it in cos you might shun me! I’m so trying this recipe tonight! 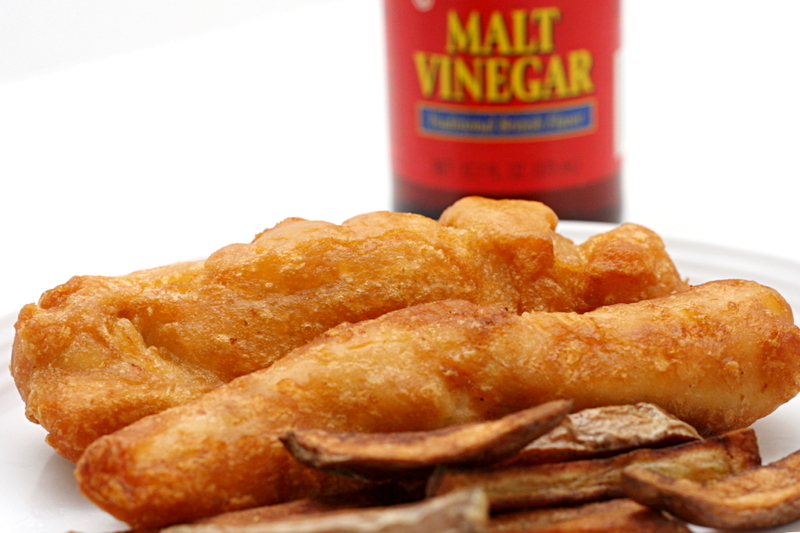 I love beer battered fish but have never made it….let the adventure begin! ale instead of regular beer. It deep fried up just WONDERFUL! pauloo – I’m glad it worked out for you! I’m pretty sure the amount of flour listed is what I used; it’s the same as in Alton Brown’s highly reviewed recipe. 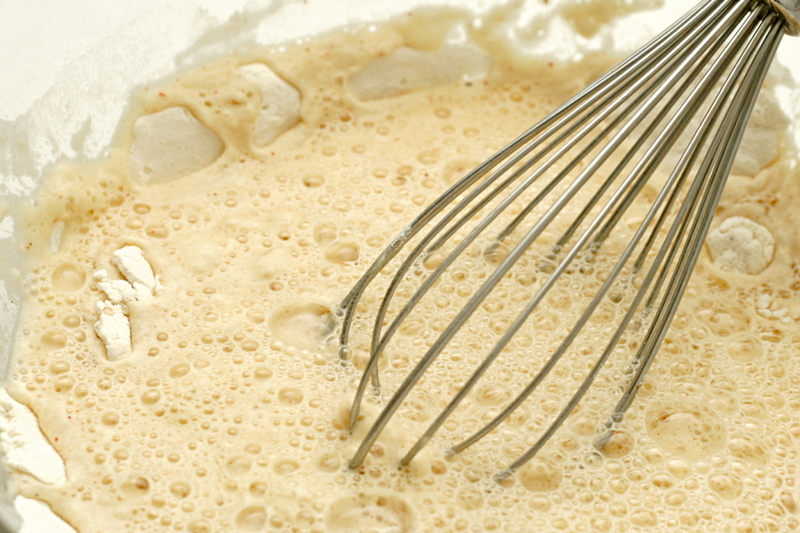 This batter also makes Killer onion rings! Outside of an actual chip shoppe in the UK…this is a GREAT alternative! I don’t allow alcohol in our home either.. I heard that sparkling, carbonated apple cider would do the trick. Sounds like it would have a similar but slightly sweeter taste but be close enough for me to try. Will check back and let you know the next time I do this! @Gemma- If carbonation and a sweet taste is sought sans alcohol, won’t ginger ale work? Two cups of flour is too much, made almost a bread dough consistency, ended up using two bottles of beer to get the right thickness. I used 1 1/2 cups of flower and added a spoon full of cornstarch. It came out perfect! It is a great recipe, worked just right the first time but I did need a little milk to thin it out just a bit. Leftovers went into the oven the next day and came out just like Gordens fisherman lol I used vermise snapper. Looks yummy ! How many centiliters is your “bottle of beer” ? For everyone concerned about using beer…..cooking removes any alcohols. You just get the nice malt yeast flavor.